La cantine, French for the cafeteria, is where children enjoy their lunches if they choose not to return home for the two-hour break. From 11:45am to 1:45pm public schools in France have lunchtime, a time to eat, learn and relax. If the students choose to stay at school for their meal, they often have a wide selection of foods throughout the month from mutton stew, roasted chicken and veal, always paired with a meatless option. Accompanying the main dish is a fruit, vegetable and of course cheese. Throughout the month there are regional recipes capitalizing on local favorites as well as resources. There is no national program in France that helps provide public school lunches assuring that all meals meet certain standards. Rather the menus are developed, reviewed and prepared by each region. Montpellier, France is a general representation of the school lunches in France. A technical team creates the menus that are then reviewed by two certified dietitians (3). The dieticians ensure the meals provide the necessary nutrients for each corresponding age group. They also take into account specific preferences of children. The dieticians will often intervene during lunchtime as well to explain the meals and educate the students on healthy eating. Before preparing the food, there is a careful selection process for products by Quality Assurance. They must be tasted and closely examined to ensure all ingredients meet criteria (such as absence of GMO’s, proper nutritional content and the least additives as possible). They conduct visits to schools to verify proper adherence to the quality guidelines (3,4). Similar to the Unites States, there are strict regulations for the storage, cooking and serving of food to ensure safety. My memories of school bought lunches include pizza, mozzarella sticks, fruit cups and the ice cream cart. Given the limited options I was always a packer. Needless to say I was amazed by the variety, quality and importance of school lunches in France. This local approach to school meal management allows them to utilize local resources and allocate more attention to the nutrition, quality and preference of meals. 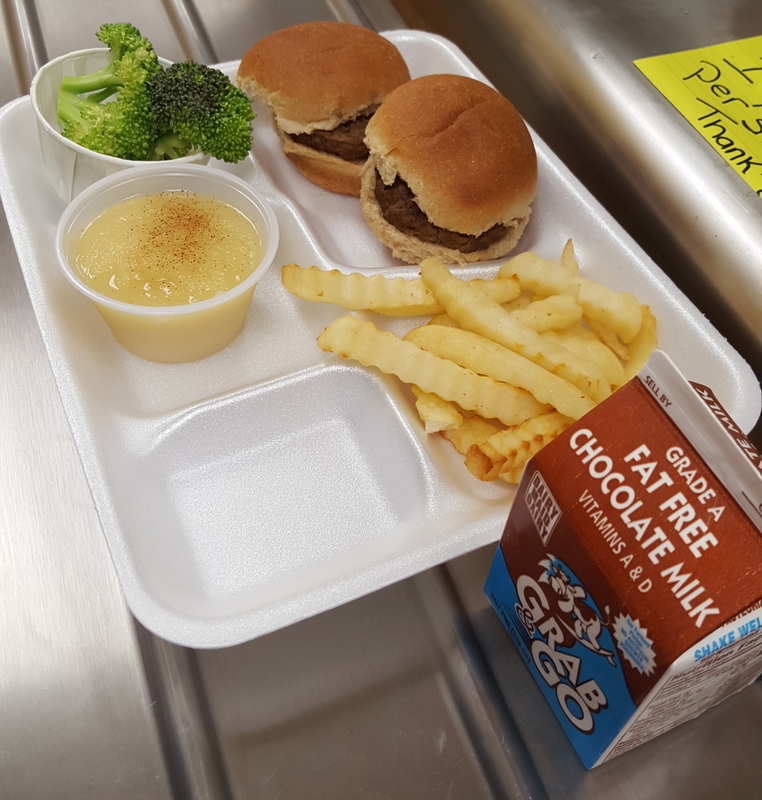 USA A school lunch in an elementary school in Maryland with two mini cheeseburgers, applesauce, French fries, broccoli and chocolate milk. France A school meal I ate at la cantine in a small town outside of Montpellier. 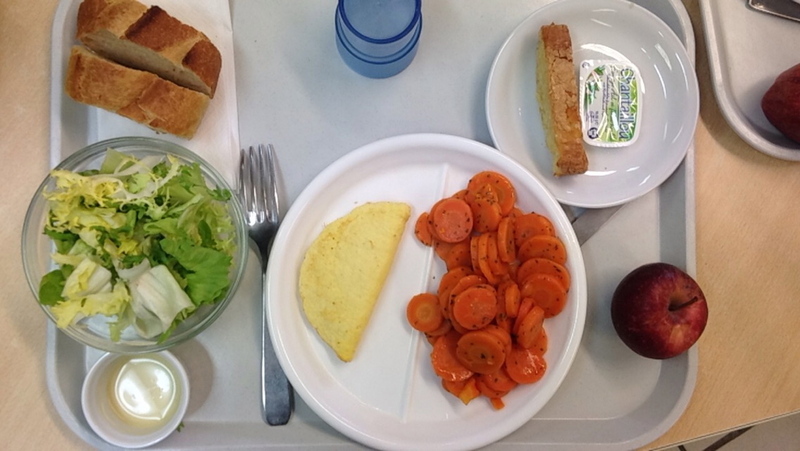 A green salad with a light oil dressing, a plain egg omelet, sautÉed carrots, fresh bread, an apple and a piece of almond cake. The omelet was a little boring, but overall a satisfactory lunch.